Anyone else have banana issues? You know, when you buy too many bananas to finish and they become brown and spotty? Yep! As the weather has been humid lately I have found that my bananas are going brown faster than Matt can eat them. He refuses to eat bananas unless they are basically green! I find myself freezing overripe bananas a lot. Frozen bananas are great, remember to chop them before you freeze them and you are good to go when you need them. This is the perfect drink to get out through the afternoon slump, especially on a sticky summers day. As you know if you are a regular reader of my blog I am a huge fan of both tea and coffee. 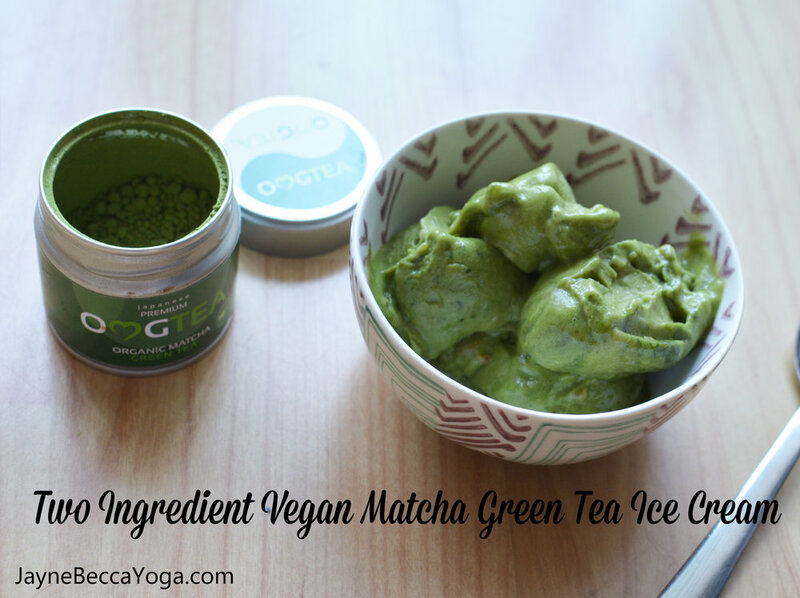 What I love about matcha tea is that it gives you an energy boost and it's loaded with health benefits! It will give you lasting energy but without the jitters or the headaches that you can sometimes get from coffee. I'm still on a yoga high after last nights Strala Yoga launch class in Bristol - 22 yogis and me, moving flowing, breathing and being! Such bliss! I made a batch of coconut and cacao energy balls as snacks for after class. As luck would have it I made just enough to go around. The recipe was requested in class and on Instagram so here we go. I must confess that I didn't really measure anything so these are approximate amounts. Happy Monday loves! I'm back home after a weekend away in Devon with family, it was just perfect. We took a trip to Bude in Cornwall and it was so refreshing to walk, ground, chat, connect and just be. I grew up living right beside the sea so the wild waves always feel like home to me. Today I am back home whipping up recipes in my kitchen and I thought this one was too good not to share! Following a HIIT workout this morning I threw together this Blueberry Bomb Smoothie to refuel. It's super easy to make and a great way to get some hemp into your diet. Hemp seeds are a complete protein, full of omega fatty acids, magnesium and iron. It's a super food!